I don’t know about you, but I’m suffering that post-summer blues where you’ve binged on one too many burgers, pizzas and fried chicken treats and starting to feel like you’ve packing a bit too much rump in that trunk. Although this may just be in my head, due to the additional layers I’m popping on to keep the chill out, I still know that I’ve neglected my Gym membership more than I should have. Working in an office where we have people harping on about fitness and healthy living all day long does have its advantages, and I must admit it has made me a little more conscious about what I’m eating and doing! All in a good way though. And unlike at my old job I don’t get tempted to eat a bacon sub for breakfast every day (although I do still stick to my 10.30am bag of crisps, whoops). Even though my weakness is savoury food, I do often crave sweet treats and if you give me a share size bar of Galaxy chocolate, there’s simply no way anyone else is getting a look in. I usually get a craving for sweet treats during the afternoon at my desk, which is quite inconvenient because my usual method at home is just brushing my teeth when I get the urge to snack without being actually hungry. If course, I can’t brush my teeth at work without looking a bit odd, so I need an alternative option. The sweet craving probably does have some scientific reason to do with the crisps I scoff in the morning actually, but I’m not letting go of that habit just yet so let’s look at the other options from MyProtein. 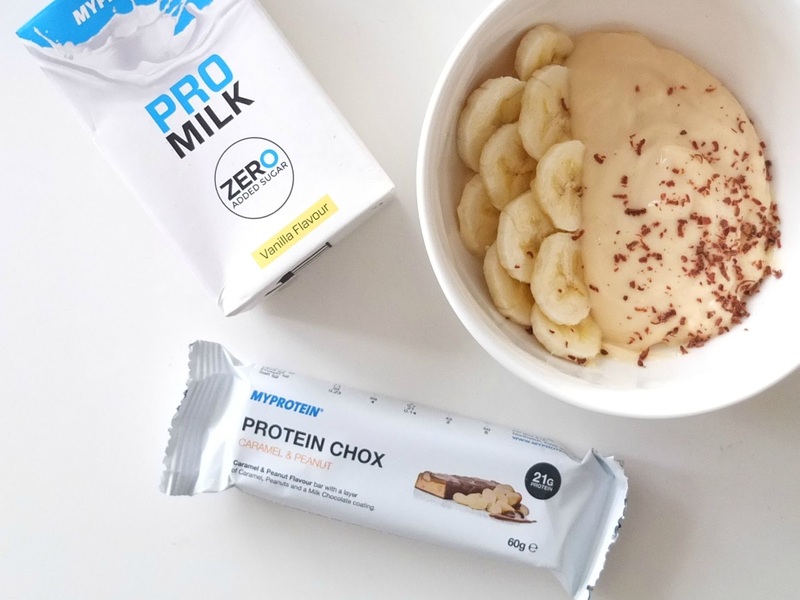 Instead of going to the vending machine to grab sweets or chocolate, I’ve been either treating myself to the MyProtein Chox bar, MyProtein Pro Milk or Protein Pudding. I cannot tell you how delicious the protein pudding is and considering it’s a custard style recipe, it’s so unbelievably filling. It takes me about half an hour to eat one in between emails. Now, you may note that the calorie count in these products isn’t far from a regular chocolate bar or packet of sweets, and can add around 200-300 calories on your daily count. However, the bonus points for protein rich snacks are two fold. One: They make you feel fuller quicker and for longer. Two: The extra work your body has to do to digest protein rich food burns more calories anyway. So overall, reaching for a protein snack, whether it’s a sweet one like this options from MyProtein or some chunks of chicken, is the best option. The MyProtein Chox bar also tastes so good it’s not like you’re even making a healthy swap anyway. My favourite from the MyProtein bar range is the peanut and caramel one, which is like a protein version of a snickers. I usually keep the protein milk to have in the car on the way back from the gym in the evening. These little cartons are handy for getting your fix on the go, although the after taste is a bit of an acquired taste.